The end-of-year holiday season is a time to celebrate the hard work and the year’s successes. To sincerely appreciate the support from Buddhist friends and local communities, Guan Yin Citta Tokyo held a grand gala at Higashi-Ojima on December 27, 2018 from 18:30 pm to 21:00pm. It attracted over 200 people and offered one of the best platforms to bring the Buddhist teachings to life. During the past 3 years, under the blessings from Guan Yin Bodhisattva and Master Jun Hong Lu, Guan Yin Citta Tokyo has been serving Buddhist friends and local communities with love and compassion. Many people facing hardships and immense struggles ultimately went through tough times by applying Buddhist wisdom to their own lives. The past 2018 was another productive year for the Guan Yin Citta Tokyo. The Buddhist Practice Center faced challenges in many areas of the work. But thanks to the steadfast support of all the Buddhist friends and volunteers, Guan Yin Citta Tokyo keeps thriving and has made concrete achievements. More and more new Buddhist friends are engaged in the Buddhist practice and learning Master Jun Hong Lu’s Buddhist teachings. A brand new Buddhist Practice Center grandly opened in Nagoya on October 27th, 2018. 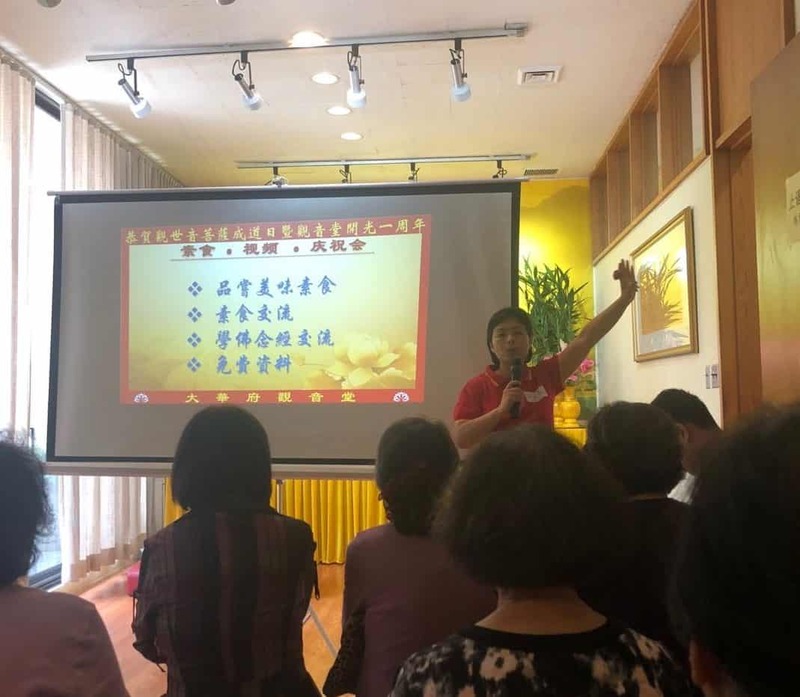 Several large scale free vegetarian food tasting events and life liberation activities were organized and boosted the sphere of influence of Guan Yin Citta in Tokyo. The spectacular gala show was prepared and presented by volunteers from Guan Yin Citta. Series of spectacular performances amazed the audience, including singing, dancing, reading, and Tai Chi performances. Some Buddhist friends shared their touching stories about how they faced life hardships and come out stronger and wiser by learning Master Jun Hong Lu’s Buddhist teachings. Their heartfelt stories touched many people and inspired them to focus on the core values of Buddhism. In addition to the excellent presentation, music, and food, the guests were able to participate in a giveaway drawing session. Some lucky attendees received beautiful gifts from the free giveaway. They had a wonderful time watching the shows and tasting delicious vegetarian food for free. Last year has come and gone, the Guan Yin Citta Tokyo is looking forward to a new year that brings new challenges and opportunities. Happy and Prosperous New Year! Being separated by the Gulf of Thailand, Cambodia and Singapore seem to be two distant countries far apart from each other. However, miles can’t shake something as sturdy as the strong affinities between Guan Yin Bodhisattva and Buddhist friends. Their aspiration of spreading Guan Yin Citta Dharma Door and Buddhist Master Jun Hong Lu’s teachings to wide public spans the miles and helps bring about the first free Vegetarian Feast event in Cambodia held on September 22, 2018. As a predominantly Buddhist nation, Cambodia has a population of over 97 percent who believe in Buddhism. Promoting Guan Yin Citta Dharma Door in such a place nurtured by Buddhist culture is full of importance and challenge. The cross-country Dharma propagation activity was first initiated by Guan Yin Citta Singapore and fulfilled with the close collaboration from Guan Yin Citta Cambodia. Nearly 90 Buddhist practitioners from Singapore traveled all the way north to the capital city of Phnom Penh and joined in the Dharma propagation activities. Not only did they spread flyers and Buddhist learning materials on streets, but also they released fish and tortoises. As the climax of these activities, the Free Vegetarian Feast event caused a sensation in local Chinese communities and delivered hundreds of sentient beings. Even though this is the first time the two Buddhist practice groups collaborated together, their mutual support and hard work rewarded them with the success of the vegetarian event in local communities. Volunteers from Guan Yin Citta were delighted to welcome such a great number of Buddhist friends coming to join in the event. More than 500 Buddhist friends attended the event and the ball room was filled with crowds. Started with a chorus singing of Buddhist songs brought by volunteers from Guan Yin Citta, the beautiful melody created an atmosphere of joy and calmness. In the video sharing session, the guests and Buddhist friends watched clips from Master Jun Hong Lu’s Dharma Talks and Totem Readings. In spite of the barrier of language, many Buddhist friends showed great interests in Master Jun Hong Lu’s Buddhist teachings and fascinated by the wisdom of Buddhism. In addition to the Dharma Talk, the heartfelt Totem Reading Cases deeply resonated with many of the guests. They were shocked to see so many people suffering in despair and lost in delusions. From other people’s stories, many guests realized that we are the heirs to our own deeds and our lives are the unfolding of karmic law. The free vegetarian event was a great success. In the near future, there will be more free vegetarian events organized by Guan Yin Citta in Cambodia to promote Master Jun Hong Lu’s Buddhist teachings. Wish the Guan Yin Citta Dharma blossoms in the land, bringing happiness and inner peace to people! This year, 2018, is a special one for Guan Yin Citta Buddhist Practice Center in Frankfurt, Germany, as it marks half a decade since it was established in 2013. Since then, the Buddhist Practice Center has remained constant in its unwavering commitment to promoting Master Jun Hong Lu’s Buddhist teachings and core values of Buddhism. To celebrate the milestone of growth and development, Guan Yin Citta Frankfurt held a Buddhist cultural gala and free vegetarian feast event at the Buddhist practice center on September 9th, 2018. Hundreds of Buddhist friends converged on the beautiful central German city and brought their hearty greetings to the Guan Yin Citta Frankfurt. They represented 21 Buddhist practice groups in Europe, including Finland, Sweden, Denmark, Ireland, France, Spain, Hungary, Belgium, Italy, Austria, Munich, Nuremberg, Hamburg, Berlin, Stuttgart, Leipzig, Hannover, Bremen, Düsseldorf, Bonn and Frankfurt. The celebration started with the Buddhist cultural gala show brought by volunteers from Guan Yin Citta. They presented the guests with amazing performances, including solo singing, “Heart light”, “Praises for Ksitigarbha Bodhisattva”, Guzheng pieces of “Pipa Whisper”, “Zen heart beside the misty river”. Some Buddhist kids performed reading Buddhist stories and reciting Buddhist scriptures in chorus. The Buddhist cultural gala showcased the great charm of Buddhism and expressed Buddhist friends’ gratitude to Guan Yin Bodhisattva and Master Jun Hong Lu. Several Buddhist friends with different backgrounds shared their real life experiences of overcoming adversity by practicing Guan Yin Citta Dharma Door. These heartfelt sharing aroused echoes in people’s hearts and acted as the best testimonials to the Dharma power of Guan Yin Citta Dharma Door. After the show, everyone enjoyed a fantastic vegetarian feast with over 40 kinds of diverse cuisines, both delicious and filling. Many guests and Buddhist friends can’t stop singing their praises of the food, and expressed their heartfelt appreciation for the meticulous arrangements and warm reception. Coincidentally, the day of the 5-year anniversary was also the birthday of Ksitigarbha Bodhisattva. On such a special day, all the Buddhist practitioners and friends commemorated Ksitigarbha Bodhisattva and his great compassion and strong vows to guide all living beings from the hell and deny to achieve Buddhahood until all hells are emptied. Surprisingly, during the day of celebration, the rare, spectacular iridescent clouds appeared in the sky above the venue of Guan Yin Citta three times and created stunning sky display. The one occurred around 6:00 pm remained in the sky for about half an hour. It started as a small circle then grew bigger to engulf the sun and the colors changed as the cloud evolved. Everyone spotted the beautiful phenomenon felt excited and blessed. The celebration was a huge success. Not only did it enhance morale, but also brought love and compassion that pulled every brother and sister together to become one. It is Guan Yin Bodhisattva and Master Jun Hong Lu who have given us such a warm home for the soul. And it is Master Jun Hong Lu’s Buddhist teachings that guide us in the journey toward unity with hope, fraternity with joy. As the spiritual home for many Buddhist friends in Germany, Guan Yin Citta Frankfurt will continue dedicating itself to transmitting love and compassion, sowing Dharma seeds and kindness, delivering more sentient beings in the future. One year ago in 2017, with the great aspiration of spreading core values of Buddhism and delivering more sentient beings, a group of compassionate Buddhist practitioners from Guan Yin Citta Dharma Door established a Buddhist Practice Center in the beautiful harbor city of Osaka. One year later, on September 9th, 2018, the Guan Yin Citta Osaka was thrilled to welcome its first anniversary and organized a free vegetarian feast event to celebrate the milestone. Over 120 Buddhist friends and 88 volunteers from different places of Japan attended the spirit-lifting celebration. Looking back the preparation stage in the last year, without the blessing from Guan Yin Bodhisattva and Master Jun Hong Lu, it would be impossible for the Buddhist Practice Center to be located in a convenient and spacious venue with such an affordable renting rate. The unconditional supports from other practice groups, such as Tokyo, Nagoya Shizuoka, and Ibaraki continuously added strength to Guan Yin Citta in Osaka and fueled its growth. The celebration officially started at 12:00pm with video clips thoroughly introducing the benefits of vegetarian diet to people’s lives and environmental protection, as well as Master Jun Hong Lu’s worldwide dharma propagation activities. Then the attendees watched Totem Readings clips from Buddhist Master Jun Hong Lu’s past Public Talks. The host from Guan Yin Citta Osaka also reviewed the development of the Buddhist practice center in the past year, including some of the main events and progress having been made. In the live performance segment, nine volunteers from Guan Yin Citta Osaka performed the reading of I have such a master in chorus, followed by the Yangko dance which cheered up the atmosphere. The Guan Yin Citta practice groups from Tokyo and Nagoya also jointly performed Sign Language Heart light, which received audience’s warm response. As the proof of the effectiveness of the practice of Guan Yin Citta Dharma Door, Buddhist friends’ real experiences are always the focus of attention. With the dramatic reversal of brutal reality, the sincere sharing arouses echoes in many people’s hearts. One of the sharing was from a Buddhist friend who fought against cancer by performing “Three Golden Practices” according to Master Jun Hong Lu’s teachings, and miraculously cured the cancer in a short one month. Another friend who had suffered brain aneurysm, an outpouching of a blood vessel wall, also cancelled her second brain surgery due to the disappearance of the tumor after 4 month practice of Guan Yin Citta Dharma Door. The third Buddhist friend shared how her brother was turned from a patient with severe mental illness to a normal person with the help of reciting Buddhist scriptures, making vows, and performing life liberation. As the event was drawing to an end, free sweepstakes were arranged and brought the event to a climax. Many free gifts were given away to Buddhist friends and practice groups to thank them all for their continuous supports, dedication and passion. Everyone was happy, absolutely excited, and bursting with gratitude. Additionally, volunteers from Guan Yin Citta Osaka specially prepared free vegetarian meals for everyone in the event. The diversified food and dishes were packed with love, kindness and gratitude, delivered the sincere give back to all the Buddhist friends and practice groups for their unconditional supports. Everyone enjoyed the delicious meals and praised for the taste. As for the future development, the Buddhist practitioners from Guan Yin Citta Osaka would unite with one heart and one mind, continuing their concerted and unyielding efforts to the spreading of Guan Yin Citta Door and deliver more sentient beings. In the evening of August 31, 2018, with the opening remark made by the mayor of Hamburg and dazzling firework show lighting up the sky, the 7th “China Time” takes place in the beautiful harbor city of Hamburg, Germany. The “China Time” was initiated by the Hamburg Senate and has been organized every two years since 2006, aiming to enhance mutual friendship between China and Germany, deepen cooperation on culture, politics, education, and economy. With the motto of “Pulse of the City”, the 23-day event of this year covers all sorts of programs and activities, including exhibitions, workshops, concerts, lectures, readings, dramas, films, sports and food events. At the invitation of Hamburg Municipal Government, Guan Yin Citta Buddhist Practice Association of Germany participated in the workshop session and organized a Chinese-German bilingual free seminar at Gemeinschaftshaus Berne on September 1, 2018. Revolving the topic of “Practicing Guan Yin Citta Dharma Door leads to a healthy and happy life”, the 3-hour seminar explored the connection between Buddhist practice and healthy lifestyle, providing insights into some of the core concepts of Buddhism and Master Jun Hong Lu’s Buddhist teachings. Over 180 guests attended this seminar, including 60 western friends and some of the dignitaries such as local scholars and doctors, as well as the Princess Jacqueline von Schoenaich-Carolath -Schilden and her daughter. More than 40 Buddhist friends from Denmark, Munich, Nuremberg, Frankfurt, Düsseldorf, Leipzig, Hannover, Bremen, Kiel and Hamburg participated in the volunteer work. The seminar was divided into four parts: introduction, Buddhist Master Jun Hong Lu’s public talks, story sharing, and free vegetarian tasting. At 13:00pm, the seminar began with an astonishing clip introducing Master Jun Hong Lu’s worldwide Dharma propagation activities and great contributions to the world peace, providing guests insights into the Guan Yin Citta Dharma Door and its founder, Master Jun Hong Lu. Then the chairman of Guan Yin Citta Buddhist Practice Association of Germany, Hong Cen Jin, thoroughly introduced the development of Guan Yin Citta Dharma Door Buddhist practice centers in Hamburg, Berlin, Stuttgart, Düsseldorf, Leipzig, and Bonn. In the aspect of mind cultivation, Master Jun Hong Lu said, “We have been living like actors in the ups and down of our life, busily living a lifetime just for food and clothing. Maybe not until the day we are leaving this world, we may realize the ultimate nature of life is emptiness. Maybe not until the moment we are staying in hospital, we may believe that we have nothing at all. What we gained before is essentially not ours. Pathetically, we took a lifetime to pursue those unattainable objects, and sacrificed the time with our loved ones. Buddha ever said, “All things contrived are like dream, illusion, bubble, shadow, and as dewdrop or lightning. They should be regarded as such.” “We should develop a mind which does not abide in anything.” Buddha’s teachings told us to detach ourselves from these sensual attachments which will generate greed.” Master Jun Hong Lu’s talk deeply impressed everyone at present, bringing them an experience of spiritual sublimation. After the public talk by Master Jun Hong Lu, the host then introduced the “Four Golden Buddhist Practices” to the guests, which include making vows, reciting Buddhist scriptures, performing life liberation, and learning Buddhism in Plain Terms, the series of books that crystallize the wisdom of Master Jun Hong Lu’s Buddhist teachings. Then the seminar processed to the story sharing session. Three Buddhist friends with different backgrounds shared how their lives were changed by practicing Guan Yin Citta Dharma Door. The first person speaking on stage was Ms. Li from Düsseldorf. She is a research scientist specialized in weapon design and engineering. In 2011, she was diagnosed with bowel cancer and suffered in great pain. It was at that time that she was introduced to Guan Yin Citta Dharma Door and started the Buddhist practice. Master Jun Hong Lu’s teachings lighted up her hope and saved her life on the verge of death. Soon after survived cancer, another unfortunate event befell Ms. Li on April 11, 2012. She was hit by a car and injured badly in her spinal cord, where the fourth quarter of the lumbar vertebrae was broken. The doctor said that there may be sequelae after the operation, which would oppress the lumbar nerves and cause paralysis. At this critical moment, Master Jun Hong Lu mercifully helped her do the Totem reading and provided her specific number of Little Houses and fishes for liberation. After making great vow, performing recitations and life liberations according to Master Jun Hong Lu’s advice, Ms. Li was gradually recovered from the injury and could walk on her own with a cane. On September 27, 2013, when Master Jun Hong Lu’s Public Talk took place at Frankfurt, she was honored to become one of Master Jun Hong Lu’s disciples. After Master Jun Hong Lu blessed her, she was able to bend down her waist and fully recovered. During Ms. Li’s sharing, many guests and Buddhist friends were moved to tears and deeply touched by Master Jun Hong Lu’s great compassion and great mercy. The second story was shared by Ms. Dezfuli, a doctor who has her own clinic in Hamburg, and with international work experience in Canada, United States, Sri Lanka and New Zealand. Three years ago, she suffered from severe spinal disease, staying in bed and unable to move. As a doctor, she tried out all kinds of treatments and received very little effect. It wasn’t until she met doctor Chen, a Buddhist practitioner in Guan Yin Citta Dharma Door, who introduced Master Jun Hong Lu’s books to her, that her illness took a favorable turn. With the daily practice of chanting Buddhist scriptures, she found herself on the right track of recovery. Since then, she started to attend the group study at the Guan Yin Citta Practice Center in Hamburg every month with no absence. She said, “It’s interesting that even though I don’t know any Chinese word, I still feel comfortable in the environment with so many Chinese friends, and connected to the Guan Yin Bodhisattva. In 2017, after participating Master Jun Hong Lu’s Public Talk in Paris, many positive changes have taken place in my life. I know that without practicing Buddhism, all these could not happen. I’m feeling more energetic and vital right now, even my family members and friends are saying so. As a doctor, I do believe that wise treatment brings real therapeutic effects, and work experience offers insight into the real cause behind diseases. But beyond that, some Buddhist approaches, especially the practice of Guan Yin Citta Dharma Door, undoubtedly provide methods to fill the gaps in contemporary medicine and successfully overcome some of the unsolvable problems and intractable diseases. I am so grateful to have such an amazing experience in my life.” The third sharing was from Ms. Cao, who started practicing Guan Yin Citta Dharma Door in mid-July 2015. During the three years’ practice, she successfully sold her restaurant and cured her daughter’s disease. After the heartfelt story sharing, all the attendees watched an interesting Totem Reading clip from Master Jun Hong Lu’s past Public Talk and enjoyed delicious vegetarian meals together. There were over 45 kinds of exquisite cuisines with diversified flavors. The delicious, homemade desserts all made by volunteers and won praise from the guests. The seminar was a huge success, promoting core values of Buddhism and Master Jun Hong Lu’s teachings to more people. Looking forward to the next “China Time” two years later and bringing more diversified activities. As the third largest town in the state of Perak, Malaysia, Teluk Intan is a place with a rich history solidified by ancient landmarks and friendly people. On September 1, 2018, a grand free vegetarian tasting event was held at the beautiful town one week after the Guan Yin Citta Buddhist Practice Center in Teluk Intan grandly opened on August 26, 2018. The event was part of the series free vegetarian tasting events organized by the Guan Yin Citta Buddhist Association of Malaysian, aiming to promote Vegetarianism and the Buddhist teachings from Master Jun Hong Lu. The event was a huge success, with attendance of over 1,300 local people and more than 400 volunteers participated. These volunteers were from different places of Malaysia, ranging from East Malaysia to West Malaysia, such as Sarawak Kuching, Sibu, Kuala Lumpur, Klang, Puchong, Johor Bahru, Muar, Kluang, Yongping, Segamat, Selangor Seremban and Malacca. In the early morning at around 8:00am, all the volunteers arrived at the San Min Independent High School to prepare for the event. Through 9 hours hard work, the event officially started in the late afternoon at 5:00 pm. Within a very short period of time, the main meeting hall was full of people from nearby neighborhoods and communities. To accommodate the overflow, another meeting hall was arranged with the big screens and service facilities fully set up. The dazzling and delicious variety of vegetarian cuisines was full of flavor and provided tasty meatless options. Diverse dishes, ranging from Dongpo meat, Malay satay, siu mai, Xiaolongbao, to Gucheng G rice ball, stuffed tofu, Nasi Biryani, red sauce pasta, Burmese salad, Gongbao golden flower, and fruit tarts, could be found and enjoyed for free. While eating, the attendees watched amazing video clips from Master Jun Hong Lu’s Dharma Talks and Totem Inquiry. These fascinating Totem cases revealed the real existence of Karma and the Law of Cause and Effect, which educated the attendees and teached them that there is another Buddhist way to live their lives. From Buddhist view, becoming vegetarian is the main approach to cultivate compassion and refrain from killing. Master Jun Hong Lu has ever said, “Compassion will resolve all your troubles. When you are annoying someone, or you’re having something upset, it is mainly because that you have not forgiven others. If you let go of the resentment and forgive others, you will open yourselves up to practicing compassion and love. Compassionate people have a level of inner courage to forgive others, which leads to resolving afflictions and trouble. “In order to achieve peace and social harmony in the world, restore the balance of mind, let us cultivate compassion and practice giving. On August 26, 2018, the Guan Yin Citta Buddhist Practice Center in Phoenix held a large-scale free vegetarian food tasting event at the Phoenix Chinese Senior Center to celebrate the 40th anniversary of the Phoenix Chinese Senior Association. The free vegetarian food event is not only a gathering and celebration to honor the contributions by Chinese Americans to the community development, but also a spiritual practice to transmit love and kindness, providing an opportunity for people to experience vegetarian culture and the core values of Buddhism. The event attracted more than 250 attendees and 50 Buddhist practitioners from New York, Philadelphia, Vancouver, New Mexico, California, Las Vegas, and local areas in Phoenix. At 11:30am in the morning, the event officially started with the welcome speech delivered by the chairman of the Phoenix Chinese Senior Association. With the chanting the Great Compassion Mantra by dozens of Buddhist practitioners from Guan Yin Citta Phoenix, the meeting hall was filled with the atmosphere of peace and solemn. Then the event processed to the main topic of “The Benefits of Vegetarian Diet”, presented by Brother Jerry from Guan Yin Citta in Las Vegas. He dived into the details of the topic with examples from medical research and viewpoints from Buddhism, which revealed the relationships between killing or eating fleshes of sentient beings and formation of karmic debts. Brother Jerry also introduced the positive impact of vegetarian diet on people’s lives and earth environment. After that, Brother Joyce from Guan Yin Citta Philadelphia thoroughly introduced the basic information and development of Guan Yin Citta Buddhist Practice Center in Phoenix during the two years. The Chairman from State Government’s Equal Employment Opportunity (EEO) Shijun Huang; the Chairman of the Federation of Overseas Chinese Federations, Zizhong Yu; the councilor from the City of Dara, Mr. Xinmin Huang; and the Chairman of the China General Association, Shunxiong Qiu then delivered congratulatory speeches respectively. The day before the event started, volunteers from Guan Yin Citta had been fully engaged in the tremendous preparation work with high intensity. They prepared diversified vegetarian dishes ranging from appetizers, entrees, salads, soups, and desserts. These dazzling vegetarian cuisines were full of flavor and rich in nutrition, providing the guests an unforgettable experience of being vegetarian. In the meantime, volunteers from Guan Yin Citta distributed the free admission tickets of the 2018 Public Talk by Master Jun Hong Lu in Los Angeles to the guests with the interest to attend. Every guest also received free gifts of a vacuum-insulated mug and newspapers introducing Guan Yin Citta Dharma Door and Master Jun Hong Lu. The event won a high praise in the community and received overwhelming responses. Since 2016, the Guan Yin Citta Dharma Door Buddhist Practice Center established in Phoenix, the Buddhist Practice Center has been committing to promoting the core values of Buddhism and Vegetarianism, dedicating to the community development and the social harmony. As one of the pure lands of Guan Yin Citta Dharma Door, Guan Yin Citta Phoenix adheres to the principles of patriotism and loving for the people, promotes traditional Chinese culture with the respect for other religions. Under the guidance of Buddhist Master Jun Hong Lu, every Buddhist practitioner from Guan Yin Citta dedicates to the practice of compassion for the benefit of all sentient beings, eradicating the inherent weaknesses rooted in the consciousness, eliminating the resentment between people, and removing the mental pressure in life. Guan Yin Citta Dharma Door Buddhist Practice Center in Phoenix opens daily and offers free vegetarian food to the public on the last Sunday of each month. Welcome to the spiritual home to start a new life! Acting as an inspiring oasis that offers every Buddhist friend a place to pray and practice Buddhism, Guan Yin Citta Buddhist Practice Center in Washington D.C. has been opening to the public for one year since its establishment on July 23, 2017. To celebrate its 1st year anniversary, Guan Yin Citta Washington D.C specially held a free vegetarian feast event at the practice center on July 28, 2018. Nearly 100 Buddhist practitioners and friends attended this event. Some of the attendees were even from neighboring States of Pennsylvania and Virginia. The Guan Yin Citta Buddhist Practice Center in D.C is a nonprofit charity organization affiliated with Guan Yin Citta USA, which is registered in US Federal government. The Guan Yin Citta in D.C is committed to spreading core values of Buddhism and serving local communities with different activities, including free vegetarian food tasting event, first incense offering in some big days, and Buddhist seminars. The practice center is an all-inclusive Buddhist practice space in the community of Silver Spring in Washington D.C. It includes the Guan Yin Hall, group study room, meeting room, dining room, and a welcome center. In the morning of 10:00am, the celebration started with the incense offering ceremony and the chanting of Buddhist scriptures. After that, the leader of the Practice Center delivered a short speech and extended the great thanks to all the friends continuously supporting the Guan Yin Citta Dharma Door and the practice center. She then briefly introduced the practice center’s daily routine and event schedules of Buddhist practice, such as the group study with free vegetarian food sharing on Saturday and First Incense Offering Ceremony on big days, such as the New Year, and the birthday of Buddha and Bodhisattvas. During the event, some Buddhist friends shared their heartfelt true stories about how practicing Buddhism changed their lives. Brother Liu mentioned that his wife once had an accident and damaged her brain and her hands could not be moved. At that time, she was struggling in the pain and couldn’t walk with her back straight. After starting reading Buddhist scriptures, making vows, and performing life liberation, her hands and brain were recovered from the irreversible damages and she is now living as a normal person. She was so grateful for Guan Yin Bodhisattva and Buddhist Master Jun Hong Lu. Without their blessings and help, it’s impossible to create the miracle and alleviate from pain and suffering. After the story sharing, everyone moved to the dining room and enjoyed delicious vegetarian meals meticulously prepared by volunteers from Guan Yin Citta D.C. There were over 20 kinds of cuisines with different flavors. From salad to entrees, from cold drink to hot soup, all varieties of food is available. With the cheerful laughter and joyful communication, the whole practice center was permeated with an atmosphere of happiness and friendship. Wishing Guan Yin Citta Buddhist Practice Center in Washington D.C. grow stronger and deliver more sentient beings in the future. Anniversary, Guan Yin Citta, Master Jun Hong Lu, Washington D.C. Categories Anniversary, VegetarianTags Anniversary, Guan Yin Citta, Master Jun Hong Lu, Washington D.C.